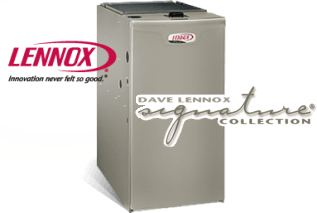 Lennox’s Signature series high efficiency gas furnace has it all, incorporating 98% efficiency with the finest in home comfort. The modulating operation (many output levels) minimizes furnace and air movement noise, generates more even temperatures throughout the home, reduces temperature swings between heating cycles, provides more air filtration, and has fewer on/offs in an effort to preserve the life of the unit. This model also incorporates a variable speed fan motor for greater electrical efficiency and better home comfort. And this furnace has more feature-rich software on the circuit board, so that if you combine it with Lennox’s iComfort thermostat, you will have features you would otherwise not have (e.g., system diagnostics, WiFi, etc.). If you are interested in having the best technology in gas furnaces today, this is the model of choice. Furnace circuit board precisely calculates the run time and output to obtain the best comfort and energy efficiency. The board also monitors unit performance to ensure proper operation.